Watchout is uniquely suited for programming multiscreen shows by bridging the gap between traditional content creation tools and hardware based media servers. It relies upon a high-speed network to orchestrating and synchronizing displays and can control virtually an unlimited number of display devices in any configurations of projectors, flat screens, LED wall and curtains as well as other types of devices. Version 5 of Dataton Watchout™ brings the most comprehensive set of new features and capabilities added since the product was introduced, significantly expanding its application areas. 3D Effects - Position and rotate all media objects in 3D space. With 3D motion paths, images and video can move freely through space, at your command. Stereoscopy - Take the new 3D capabilities all the way to the screen with stereoscopic projection and production workflow, including direct playback of 3d stereoscopic video. 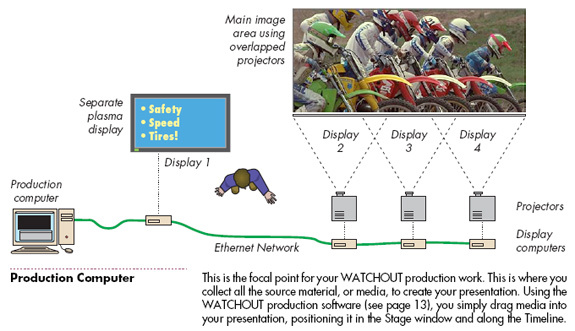 Enhanced Live Interaction - You can now use inputs in Watchout to control virtually all parameters of the WATCHOUT presentation using external sensors, touch panels or other input devices to control the 3D-position of images and video on stage, including live sources. This new Watchout server application provides continuously updated content, streamed into your presentation. A single server can provide multiple images at the same time, accessible from any number of Watchout displays. It acts as a bridge between your Watchout display system and various data sources, rendering live data on the fly. 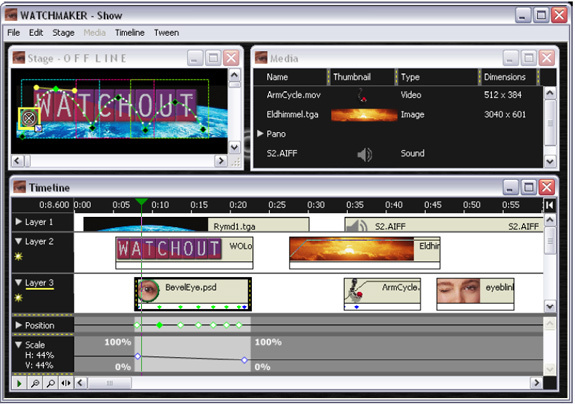 A media artist programs a Watchout presentation using familiar timeline tools importing and manipulating media objects on the stage. Media can be manipulated using scaling and positioning, 3D-rotation, color keying, transparency as well as color adjustments and cropping. Using the timeline a programmer can control how the timeline loops and responds to user inputs and sensors and now with new tools offered in version 5; you can incorporate dynamically served content from nearly any source including feeds from the Internet and databases. Watchout is compatible with most media file formats from a number of programs like Photoshop, After Effects, Final Cut and Adobe Premiere. Watchout can also incorporate live feeds of various kinds from video cameras, satellite feeds and even another computer's display output. Below are a few of the many possible display configurations possible with Watchout. If you're planning to use Watchout in your next multiscreen environment or simply want to learn more, call nVision. We're technology and content producers. We know Watchout and can help you develop rich content for your next experiential marketing event, tradeshow or museum exhibit. To learn more about Dataton Watchout, visit the Dataton website.